This year marks the 17th edition of this fantastic International Firework competition and showcase event. There are three separate venues, taking into consideration the island’s complex layout, allowing all the residents to get along to one of the display night’s. Fireworks have formed a major part of all local festivals and fireworks have been at the very heart of the Maltese culture for centuries. The event is organised today by the Ministry for Tourism on the island and over the years has come to include professional teams from all over the world including Canada and most of the countries across Europe at one time or another. Although for the most part, this is an excellent opportunity for the companies taking part to show off their wares, there are some international companies creeping into the mix over the last couple of years. Whilst most of the teams were very close across the synchronicity and the effects and sounds, the music selection and their overall untidiness, in particular, lost the Croatian and Romanian teams a number of crucial points and when it comes down to 3 points between winning and losing, they really need to clean their act up (no pun intended … honestly). The beautiful island of Malta is a hugely popular tourist destination, playing host to around 1.2 million visitors annually, which is more than 3 times the population who call it home. The island enjoys the highest average sunshine across the whole of Europe, but this offers up other issues including a lack of water through the summer months. Malta has been inhabited for over 7200 years and the original settlers built huge temples and areas for worship which remain today and are acknowledged as some of the oldest free-standing structures in the World. The most famous of the residents historically are the Knights of Malta who started out as a group of monks tasked with taking care of the sick and needy in Jerusalem. Over the years, they became an army of men, usually from wealthy noble families, who defended the Holy Land and brought with them the financial support they had been afforded all their lives. In 1530, they arrived and settled in Malta, staying for almost 270 years before the order collapsed in 1801. That was the end of their occupation of Malta but they re-established themselves in the early 19th century. Today, the order is still huge and has members totalling in the tens of thousands, all of whom swear a Christian oath of allegiance to uphold their charitable works and many of them are still in the medical profession, harking back to the original order’s ethos. There are 35 firework factories in Malta, which is sizable until you take into consideration that there are 70 plus feast days annually including one for each of the three patron saints. This year’s line-up has not yet been announced but we will bring this to you before the event is due to take place. 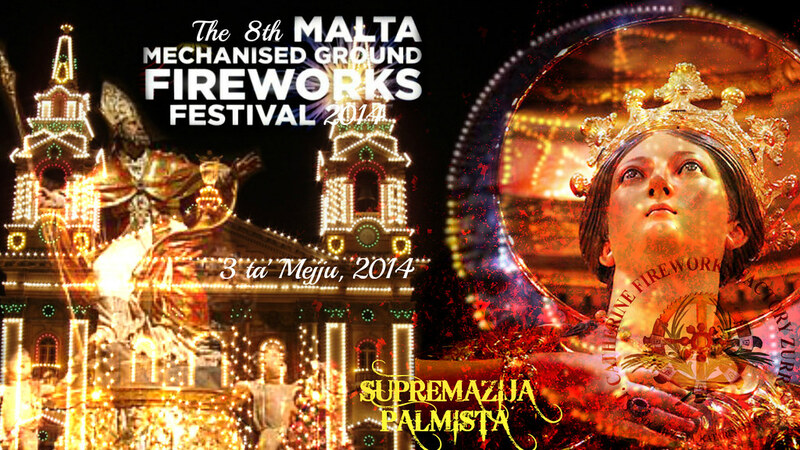 This year marks the 12th mechanized ground fireworks festival in sunny Malta which is an event organized by the Floriana Local Council. Ground fireworks are a uniquely Maltese tradition which forms an important part of festa (fiesta) celebrations in Malta and Gozo. The event begins on 13th April at 10.00am where you can see the set up in daylight so you can see first-hand the complex intricacies of these very special mechanized creations. The displays actually take place on Saturday 14th April at 10.15pm and they are absolutely fascinating with contra-rotating mechanisms and others which move in and out using a huge number of gears and chains called Katina to wonderful effect. Last year’s winning team was from St Michaels Firework Factory in Lija and the piece included dual wheels, 1800 drivers and it changed colour and shape constantly including the addition of screeches at the end. A very well deserved win for this incredible creation. This event takes place in the midst of the Fireworks Festival in Malta which takes place from the 1 st to the 30 th April 2018 so you will be royally entertained if you can manage to schedule your holiday within these times – particularly for a pyrotechnician.